From the man that brought you “the 8th Note” come one of the most talked about albums to date. 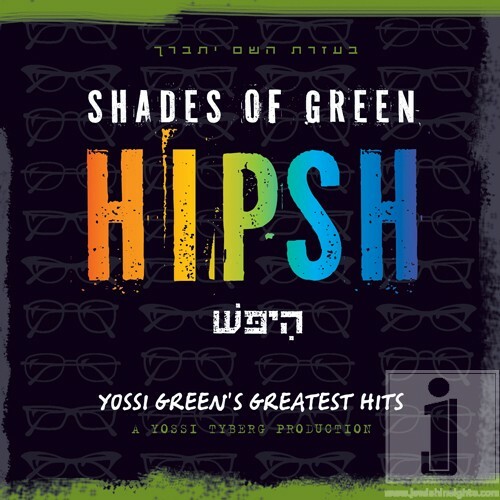 Yossi Green has been hard at work the last 3 years on Shades of Green: Hipsh, the next gem in the YG collection. Ever want to hear a Yossi Green classic, new song in it’s entirety without having to go through the entire CD? Well then this is the album for you. HipSh features 26 songs in 13 twin-song jaw dropping tracks to date in Jewish music. Just to give you a taste; the is a Shades of Dance, Shades of Motown, Shades of Broadway, Shades of yiddish and EVEN a shades of Acapella. Basically there is something for everyone and you get to hear the master composer sing them the way they were meant to be heard. So whether you love Anovim from 8th Note, Yishoma from Gertner or Aderaba from Fried this is that album with ALL THE HITS. Plus the song Always On Call produced in the style of The 8th Note material! This bonus track is a song honoring the dedication and sacrifice of Hatzolo members throughout the world! The new Shades of Green: Hipsh is now available online for download and in stores. You can download it now, 13 tracks plus a brand new song, Always On Call, a Hatzalah song performed by Michael Ian Elias, produced by Mo Kiss in the style of 8th Note. Download the album, plus the full PDF booklet by clicking here.